Love this combo. Goes on very light. 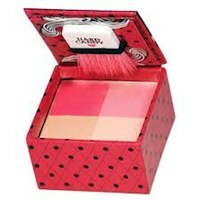 i love hard candy, this blush and bronzer are the best makes me look wonderful all day. I LOVE these blushes, I've tried two different colors in these boxed blushes. They are gorgous, I'm fairskinned and this one gives me a "I've just been naughty" look. It makes my cheeks look soo rosey, I love it. I have had this blend of blush and bronzer for a while. I love using this, because it gives you an equal amount of blush and bronzer. I use this almost everyday. Such a great product! This line of blushes from Hard Candy are great. Theyre available in 4 colors, 2 of which are blush/bronzers-and the other two are a combination of 4 blushes that you can wear alone or mix together. The come packaged in a cardboard box-similiar to Benifit boxed blushes- in both packaging and product. I own a Benifit blushes and i would prefer the Hard Candy. The Hard Candy does exactly what the high-end product does-in some color combos, it does it better!! Awesome buy for $6.